Whether you're an engineer, student, or hobbyist, these publications on the PIC® MCU lay the groundwork for embedded development. Sharpen your skill set, discover new examples and experiments, and learn all there is to know about the Microchip PIC® microcontroller and C programming language. This book demonstrates the programming methodology and tools used by most professionals in embedded design. The reader will be able to apply what they learn to real-life embedded applications. Providing a step-by-step guide to the subject matter, this book will encourage you to alter, expand, and customize code for use in your own projects. 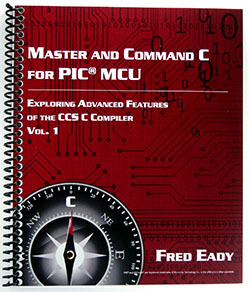 Master and Command C for PIC® MCU gives readers the opportunity to look over Fred's shoulder as he explores some of the CCS compiler's more advanced built-in functions. Beginners to advanced CCS compiler-users alike will likely learn several new tips and tricks to improve their coding style. 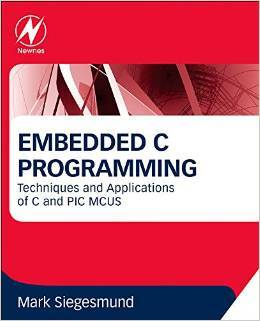 This book is aimed towards those who do not know C. The basics of C are explained from the perspective of writing programs for the PIC® microcontrollers. Although there are many C starter books in the bookstores, most assume a PC target. PIC® microcontroller programming is different even though the language is the same. 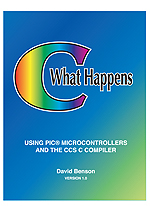 This book includes examples that work with the CCS C compiler. Dennis Richie is the original creator of C and this is the book that introduced C to the world. The CCS C compiler used the first edition of this book as the reference for the design of the compiler. This is a short but sweet look at C with all the details of the language simply explained. Note that the second edition of this book covers enhancements to the language made by an ANSI standards group. Not all ANSI enhancements are included in the CCS C compiler since some are geared toward larger computers with different resources. For example most PIC® MCUs do not have a hard disk connected and a file system. This is a great reference book for all C programmers. This is a very popular book that covers the information in the Microchip datasheets in an easy-to-read format for the beginner. This may be a good book for those who have not used microcontrollers before. This book can also be purchased directly from Square 1 Electronics. 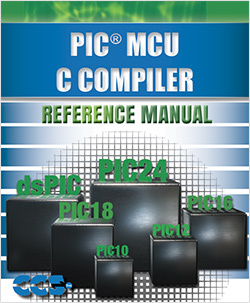 This is a more advanced book not specific to the PIC® MCU or the CCS C compiler. It does have some good general principles for embedded programming. This book defines all the standard C functions in good detail. Many of these functions do not apply to C on a PIC® MCU, but for those that do this is the reference. In general most users should not need this book as the compiler reference manual and the C programming language book cover the essentials. This book is a clearly written, insightful manual for engineers interested in writing embedded-system software. The example-driven approach puts you on a fast track to understanding embedded-system programming and applying what you learn to your projects. Learn how to do big math on small machines, write fast and accurate library functions, master analytical and numerical calculus, perform numerical integration to any order, and implement z-transform formulas. This handbook is intended to acquaint users with methods for designing complex math subroutines and, in the case of the most commonly needed functions, to provide them with the necessary tables to do so efficiently. 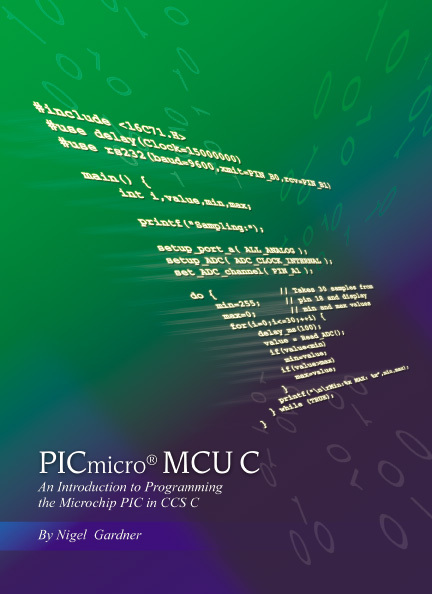 This 967 page book covers the programming of PIC® microcontrollers in CCS C V5 in a practical hands-on approach. It also has complete examples of all functions and circuits for you to build and use. The PIC16F88 was used as a starting point, used here to connect various sensors. It has 18 chapters and 10 appendices, covering the basics to more advanced sensor interfacing. C Compiler Reference Manual by Custom Computer Services, Inc.
Familiarize yourself with all of the built-in functions, example programs, pre-processor directives, tricks and tips with the hardcopy of the latest CCS C Compiler Reference Manual. Nuts & Volts is the leading magazine for those seriously interested in electronics. Nuts & Volts is written for the hands-on hobbyist, design engineer, technician, and experimenter. The diversity of subjects appeals to all levels of experience and spans such topics as amateur robotics, circuit design, lasers, computer control, home automation, microcontrollers, data acquisition, new technology, DIY projects, electronic theory, and more. Click on the link above or the image to the right and sign-up for Nuts and Volts today! These are included on the PCW or PCWH CD-ROM or can be downloaded from Microchip's web site. Hard copies may also be obtained from local Microchip offices. The datasheets cover the details of how the PIC® MCU works, how to wire it up, and exactly how the special features in the chip work (like the timers and A/D converter). The built in functions of the compiler shelter most users from needing all these details however it will help to fully understand the part. The CCS Download Manager can be used to keep your local copy of the datasheets up to date.